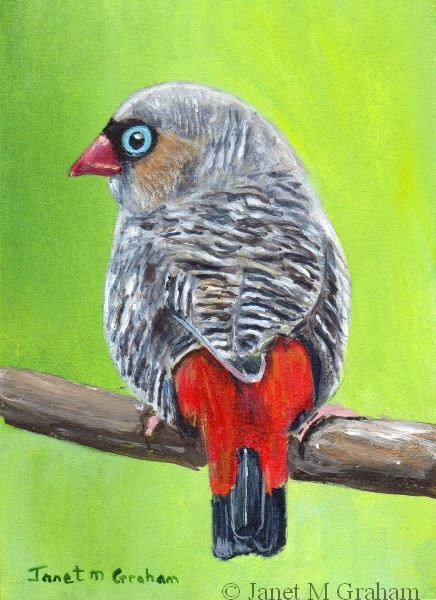 I managed to paint one of my bird aceo's that I had planned. I will have to see if I get a chance this weekend to paint the other one. American Goldfinch's are also known as Eastern Goldfinch's and are a small finch that measure around 11 - 14 cm's. 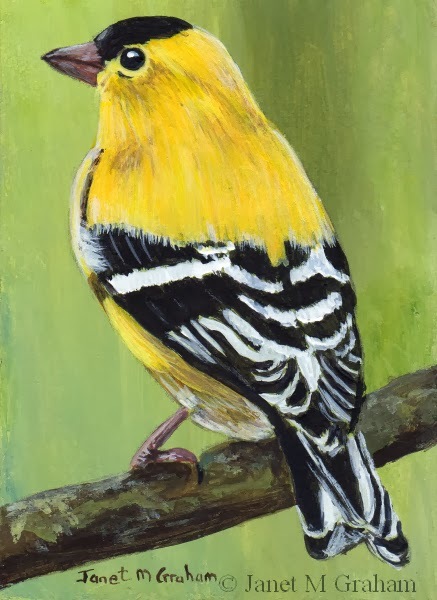 American Goldfinch measures 2.5 x 3.5 inches and is painted on 300gsm smooth Arches watercolour paper. So this is the very cute lion cub that I was working on last week. I really enjoyed painting him. I have a tiger cub lined up next to paint. Just didn't get around to it this week. Just been one of those weeks were other things have come up so didn't mange to paint all the paintings that I had planned to do. 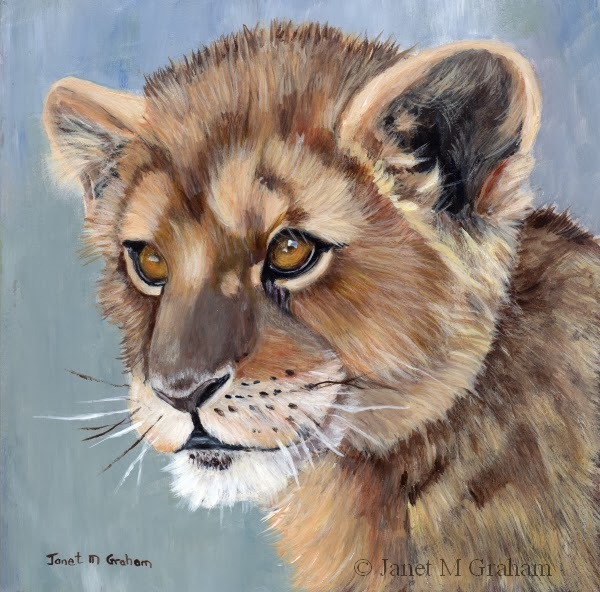 Lion Cub measures 6 x 6 inches and is painted on Ampersand Gessobord. I wasn't sure if this one was going to work. But I kept working on it and eventually it started to come together. Rather pleased with the final painting. I am enjoying painting the animal aceo's so will look for some more reference photos that I can use. 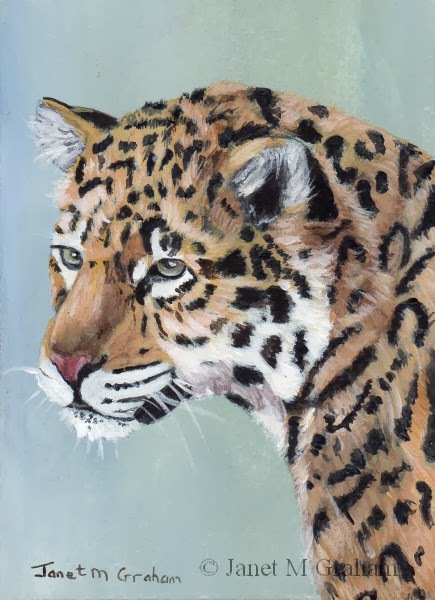 Jaguar measures 2.5 x 3.5 inches and is painted on 300gsm smooth Arches Watercolour paper. Many thanks to David Stribbling for the reference photo. I battled a bit with the background colour. I started off with a greenish background and didn't like it. So then I went for a greyish background but when I started painting the bird, it just looked too lifeless. So then I changed it to more the burnt umber with a bit of burnt sienna and yellow ochre and suddenly the painting all just seemed to take shape. Really pleased with the final result. These birds are found in Northern and Eastern Australia, Tasmania, lowlands of New Guinea and neighbouring island and out to North Maluka and Romang. They are a small kingfisher measuring around 17-19 cm's. 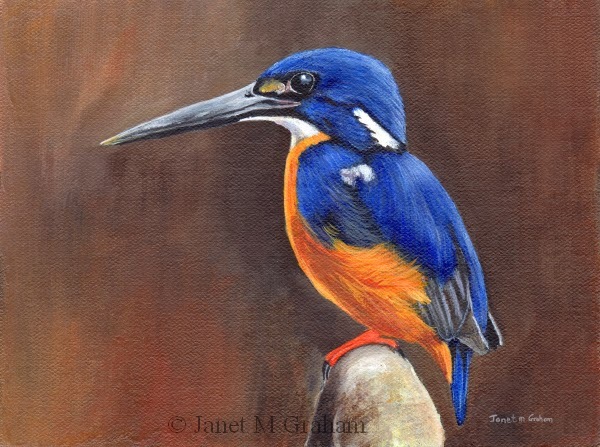 Azure Kingfisher measures 8 x 6 inches and is painted on Raymar's Feather Light Smooth Portrait Cotton 1/16" panel. I am really pleased with how this one turned out. It all just seemed to come together. These birds are found in the northeastern lower peninsula of Michigan and winter in the Bahamas. They require areas with small jack pines for nesting and were nearly extinct 50 years ago as the jack pines require fire to open their cones and spread the seeds, so with the suppression of fires, their habitat declined. Today there habitat is being preserved so they are recovering. 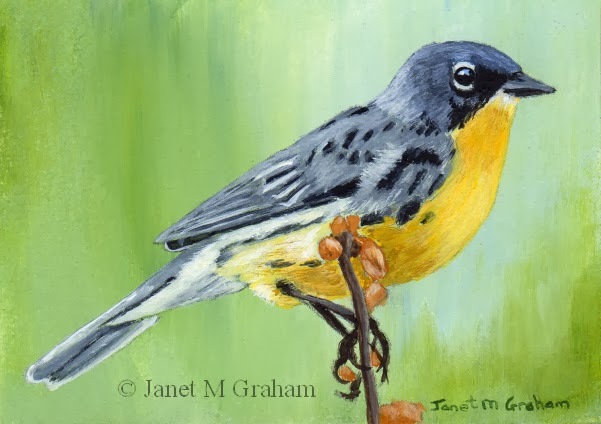 Kirtland's Warbler measures 3.5 x 2.5 inches and is painted on 300gsm smooth Arches watercolour paper. Many thanks to USFWS / Joel Trick for the reference photo. Enjoyed painting this one. When I was finished I thought the branch looked a bit bare so added the pink blossoms - made it a bit more interesting. These birds are found across Europe and Asia and are part of the finch family. They measure around 11 - 12.5 cm and weigh around 10 - 18 grams. 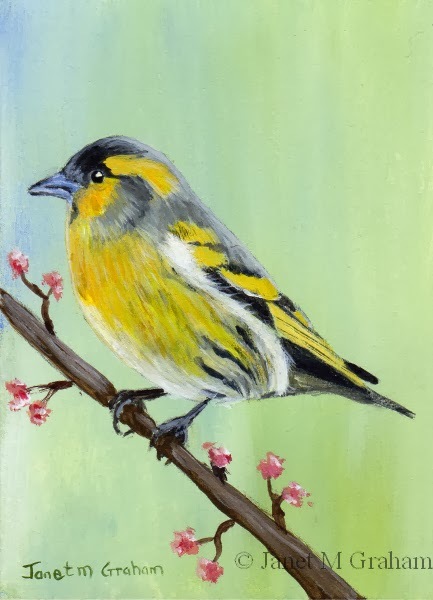 Siskin measures 2.5 x 3.5 inches and is painted on 300gsm smooth Arches watercolour paper. Many thanks to Kev Chapman for the reference photo. I felt like a break from detail so painted this country scene. Rather pleased how it turned out. I usually find by just painting a watercolour painting then I feel ready to go back to detail. Working on a cute lion cub at the moment. It is coming along nicely - will post it next week once the paint has had time to cure. 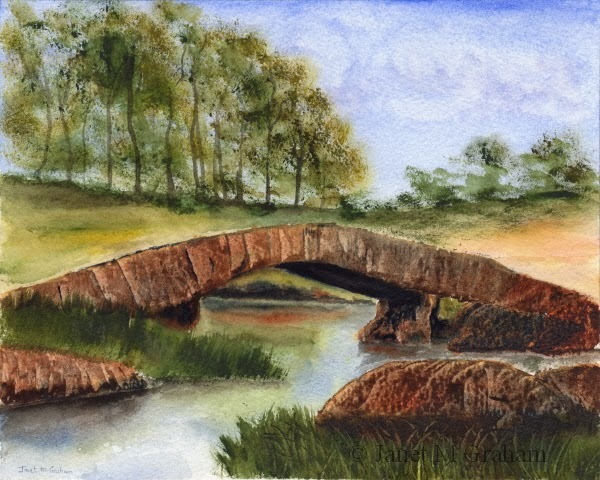 Country Bridge measures 10 x 8 and is painted on 300gsm rough Arches watercolour paper. Many thanks to Sharon Whitley for the reference photo. Nearly gave up on this one but I have learnt that sometimes you just have to keep working on a painting and suddenly it just starts to come right. Fortunately it worked with this one. Rather pleased how it turned out in the end. I had to use the number 4/0 round brush again for the eyes. 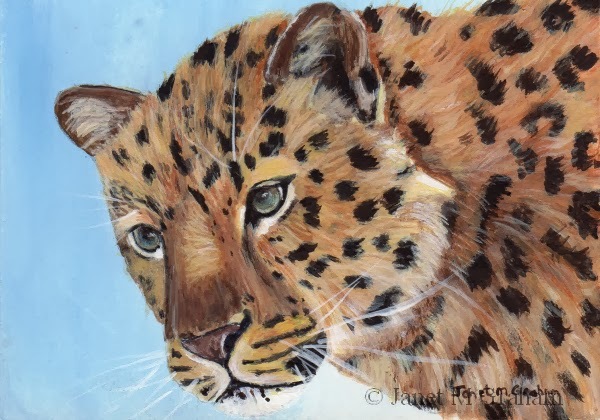 Leopard measures 3.5 x 2.5 inches and is painted on 300gsm smooth Arches watercolour paper. I finally got around to painting this one. Rather pleased how it turned out. Took a while to paint due to the pattern on the wings - much easier and less complicated painting birds. 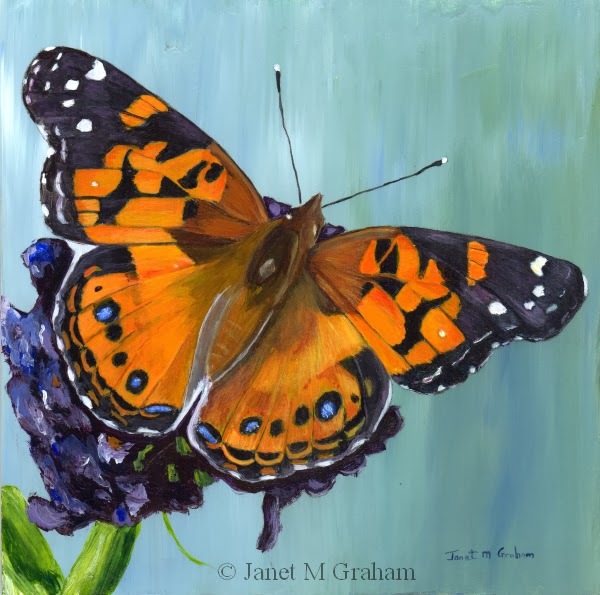 American Lady is measures 6 x 6 inches and is painted on Ampersand Gessobord. Many thanks to Andy Reago and Chrissy McClarren for the reference photo. 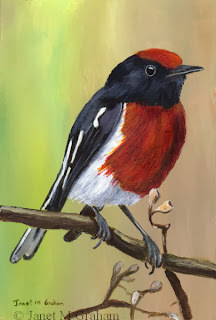 So for my next Australian bird, I painted Red Capped Robin. Robins are another one of my favourite birds - they are just so colourful. Rather like the background that I created - went for a two tone effect - I think it works rather well. Red Capped Robin measures 4 x 6 inches and is painted on 300gsm smooth Arches watercolour paper. 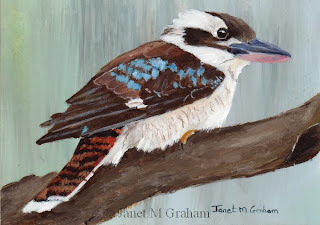 I decided to paint Australian birds this week so also painted the Kookaburra. Also really pleased how this one turned out - like the background effect that I created. Kookaburra measures 3.5 x 2.5 inches and is painted on 300gsm smooth Arches watercolour paper. Many thanks to Pauline for the reference photo. 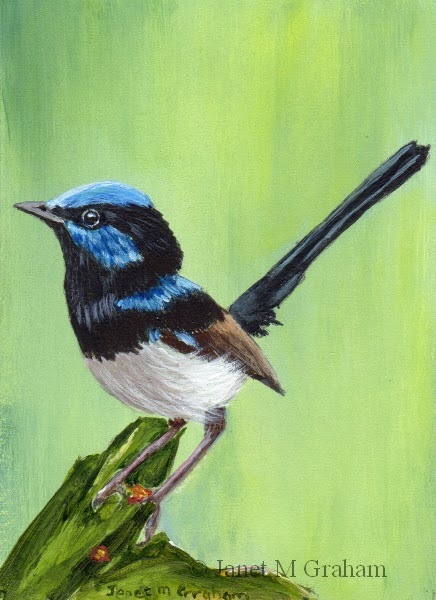 I had to paint another Superb Fairy Wren since they are one of my favourite birds. I am really pleased how this one turned out. It all just seemed to work - just had to lighten the background a bit. I still want to paint a male and female wren in one painting - it will be 6 x 8 inch as I like that size. I still need to order some more panels - I see that Ampersand has now come out with a 6 x 8 inch panels so I have to make a decision on either going with the gessobord panels or the Raymar canvas panels - still undecided - both have there pro's and con's. Painting a Kingfisher at the moment on the canvas panel so see how turns out before making a final decision. Superb Fairy Wren measures 2.5 x 3.5 inches and is painted on 300gsm smooth Arches watercolour paper. I really enjoyed painting this one. Love its markings and colouring. These birds are also known as a Painted Finch and are found across Northern and Central Australia. Painted Firetail measures 6 x 4 inches and is painted on 300gsm smooth Arches Watercolour paper. I decided to paint this one after all. I had to use my 4/0 sable brush for the eyes as I need to get a bit more detail - I usually can just use a no 3 but with the different colours in eyes I need a much finer brush. I am rather please how it turned out in the end. Tiger Cub measures 3.5 x 2.5 inches and is painted on 300gsm smooth Arches watercolour paper. Really pleased how this one turned out. I set out to create a very stormy looking sky - was going to use Payne's grey for the darkest part of the sky but I always find that it dries a lot lighter so decided to try out Indigo colour that I bought a few weeks - really worked well and I love the effect it created so will have to use colour a bit more often. 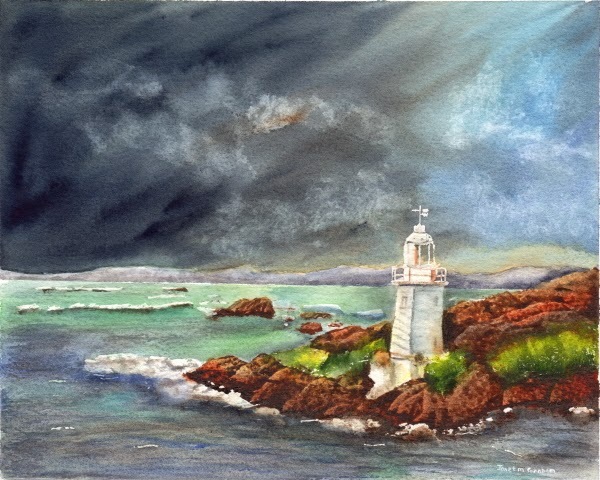 Calm before the Storm measures 10 x 8 inches and is painted on 300gsm rough Arches watercolour paper. This one was a difficult one to paint - nearly gave up on it but eventually used a larger brush and just made more of an impression of its feathers. 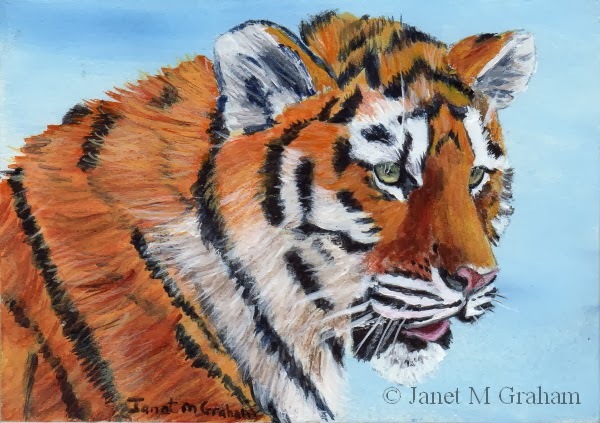 Think I will have to paint something that is not too detailed next - I have a tiger cub aceo that I want to paint, but might leave that one for later on in the week. Beautiful Firetails are found South eastern Australia from Newcastle to Kangaroo Island. They are also known as Firetail Finch or Tasmanian Finch. I wish I had seen one when I was in Tasmania. 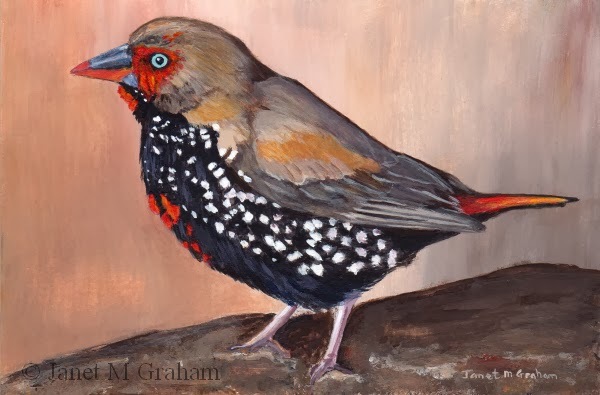 Beautiful Firetail measures 2.5 x 3.5 inches and is painted on 300gsm smooth Arches watercolour paper. I really enjoyed painting this one. Just all seemed to come together. Yesterday was rather hot again but a storm built up so it cooled everything down last night. Today is not too bad - not so hot that I have to run the air conditioner. Eastern Towhee's are breed across Eastern North America and migrate down southern United States. They belong to the sparrow species and their length ranges from 17 - 23 cm. 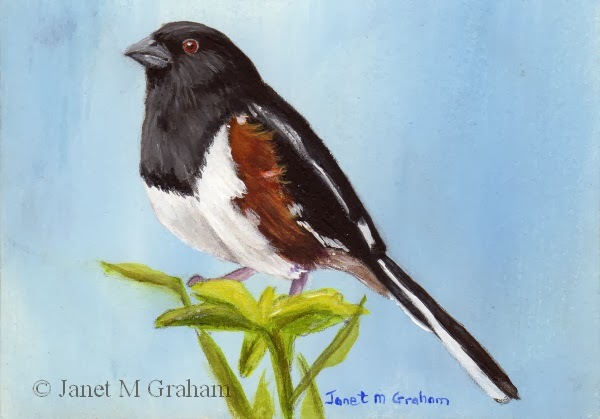 Eastern Towhee measures 3.5 x 2.5 inches and is painted on 300gsm smooth Arches Watercolour paper. Many thanks to Bill Thompson/USFWS for the reference photo. This one was a bit of a challenge to paint due to the markings and also the paint was drying a little bit too fast even though I was running the air conditioner!!! It reached 39C yesterday. Ended up painting just the one painting yesterday mainly due to the paint drying so much faster. It is a bit cooler today so I might try and paint another one this afternoon - just depends when the tennis ends - I want to watch the Federer and Hewitt match that is on this afternoon - should be a good match. Northern Flicker's are part of the woodpecker family and found in most parts of Northern America, parts of Central America, Cuba and Cayman Islands. 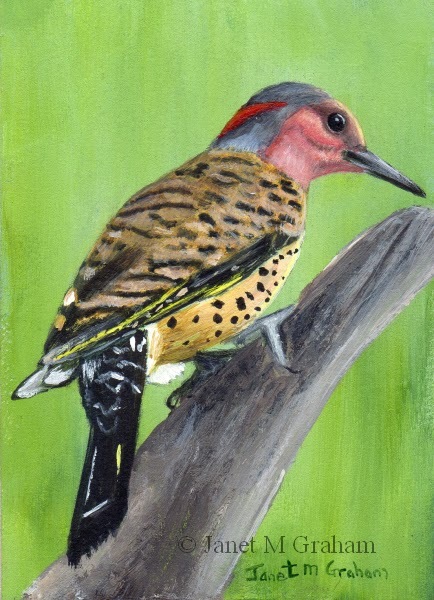 Northern Flicker measures 2.5 x 3.5 inches and is painted on 300gsm smooth Arches watercolour paper. So for my first painting for 2014, I decided to challenge myself and paint a snow leopard but in the ACEO size. It was rather fun painting an animal for a change and I am really pleased how it turned out so I will be painting more animal aceo's this year. Today has been really hot - I have been running the air conditioner since 7.15 am. Tomorrow they are predicting that Brisbane will reach 41C!!!!. Never experienced temperatures this high before. I think it will be another day of staying home and running the air-conditioner - at least I should be able to paint the bird aceo's that I had planned to paint earlier this week but never got around to. 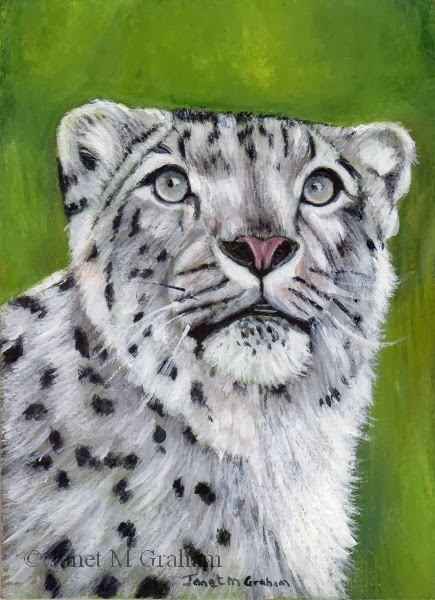 Snow Leopard measure 2.5 x 3.5 inches and is painted on 300gsm smooth Arches watercolour paper.